dhtmlxGantt 2.0 can be initialized on a page with the native jQuery syntax, making it easy to use the Gantt chart on jQuery-powered websites and apps. The new version also introduces a ready-to-use integration with the server side (now available only for PHP, but we plan to add other technologies later). dhtmlxGantt can load data in JSON and XML formats and supports custom save logic. With the new version, you can customize the time scale for your needs. For example, you can set multi-line headers to show weeks and days, or days and hours. The weekend days can be highlighted in a different color. We have also added a long-awaited zooming feature – the timescale can be changed dynamically to show different time units: hours, days, weeks, months, etc. It’s totally configurable. In addition to the ability to manage tasks using intuitive drag-and-drop behavior, dhtmlxGantt 2.0 also provides a customizable popup lightbox to change the details of the task. You can add custom fields and buttons and configure the form in the lightbox for your app needs. The Gantt chart also supports tooltips and ‘quick info’ popup to show the details for each task. The new version comes with 4 skins: terrace (default), broadway, skyblue, and meadow. You can choose the skin which suites your design. Version 2.0 also has ready-to-use localizations for English, German, French, Russian, and Belarusian. If needed, so you can add your own localization with ease. dhtmlxGantt 2.0 supports 3 types of dependency linking: finish-to-start, star-to-finish, and finish-to-finish. Dependency links can be created right on the chart by drag-and-drop (optional). The task bars show the progress of task completion and the end users can change the percentage of completion by dragging the border inside the task bar. 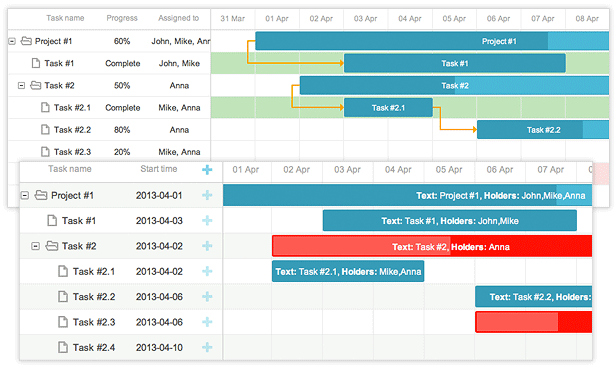 In the left pane, the tasks can be organized in the tree grid view with graggable and sortable rows. In addition to the features listed above, dhtmlxGantt 2.0 also supports touch screens and works on mobile devices (iOS, Android). It comes with detailed documentation and a bunch of technical samples, which helps you get started and create an editable online Gantt chart quickly. dhtmlxGantt 2.0 is available under open source (GPL) and commercial licenses. Learn more and download dhtmlxGantt 2.0. Feel free to leave your thoughts and feature suggestions in comments. Does it support multi-predecessors already? A task can have several predecessors (if the order of tasks is defined by links, multiple links can connect predecessors to one task). A really great improvement from the previous version. You did an excellent job! is there an auto schedule? when drag the end date time the predecessor the start date time automaticly change. is there an auto schedule? when drag the end date time the predecessor the start date time automaticly change. and is it possible to put more than 1 bar in 1 line? and is it possible to put more than 1 bar in 1 line? im trying to create a sample project management as part of my academic project. ive got two users. admin & client. i want the admin to be able to edit the JSON , while the client can only VIEW the GANTT? is there any possiility to limit editing by various users?